TAMMY: Oh, Skip- er, Chip, you're so handsome! CHIP: Thanks for giving Skippy Squirrel that invisibility cloak, Gadget! Now he and Tammy can continue their relationship without the copyright lawyers noticing! Tammy:" Chiiiiiiiip......" Chip: "Gadget, what was it that you said was in this cologne? Squirrel pheromones?" Tammy: Hey, Chipper, you're more cooler than the 007 actor, Sean Connery. Chip: Yeah, Tammy. However, Pierce Brosnan is the coolest! 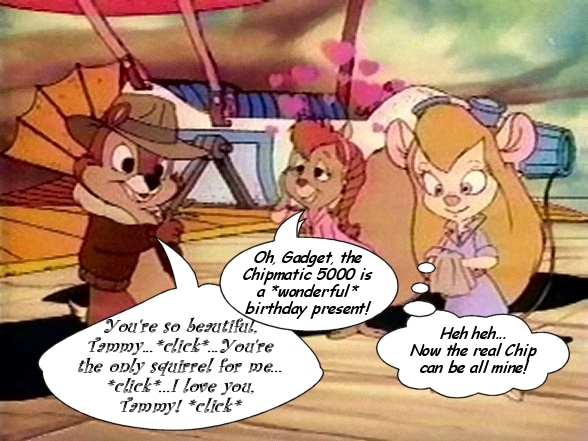 Chip: Wow, you were right Gadget! My thumb has gotten smaller since I stopped sucking on it! Tammy: Oh, Chip you have such a cute thumb... kinda small though. Chip:Okay call it girls,heads or tails? Whoever wins this I'll go out on a date with. Tammy:Well considering that's my double headed coin I gave you to use I call heads. Tammy: I can't believe I am standing next to, THE RANGER PLANE. Chip: "That was really tasty, Gadget!" Tammy: "Thanks, Chip! I made that, but you weren't supposed to EAT it..."
Chip: And then their was the time I was the thumb wrestling champion... Gadget: Yep, he's right! Gadget thoughts: Still not clean, still not clean, still not clean, but anything to get rid of Chip. Tammy: Isn't Chipper wonderful? !